While the Black Friday sales will be un-curtained on the fourth Friday or one day before among the street retailers like Bestbuy.com, Target.com or Macy’s.com, many Black Friday promotions from online stores have already been kicked off since the beginning of November, 2013. This post will focus on sharing the Black Friday 2013 ads released by popular China-based online shops. Focalprice.com Black Friday 2013 Round-1 Deals: Up to 30% Off on cool gadgets including cell phones, tablet PCs, wireless keyboards, Apple accessories and consumer electronics. More Black Friday specials will be release by the store with up to 50% off. Ahappydeal.com Black Friday 2013 Deals: Up to 54% Off on 2013 hottest electronics including cell phones, tablet PCs, car electronics, essential Black Friday accessories, micro SDHC/ TF memory cards, universal wireless car chargers with holder, RC helicopters, children’s toys, compact knife sharpeners, novelty household fizz saver dispenser switches, magic max personal trimmers, skull transparent glass cups and more. Miniinthebox.com Black Friday 2013 1st Round Sale: Buy 2 or more to get 2% off; buy 6 or more to get 4% off and buy 10or more to get 8% off on cables & adapters. Everbuying.com Black Friday 2013 Deals: Up to 51% Off on Android cell phones, tablet PCs, iPhon, iPad & iPod accessories, women’s clothing, fashion watches, consumer electronics, computers and networking gadgets, LED lights, car electronics and GPS and home and beauty products. The above listed Black Friday 2013 ads are just a tiny piece of the whole Black Friday promotional activity hosted by Chinese stores. As the big day is approaching faster and faster, more deals will be released day after day and week after week. 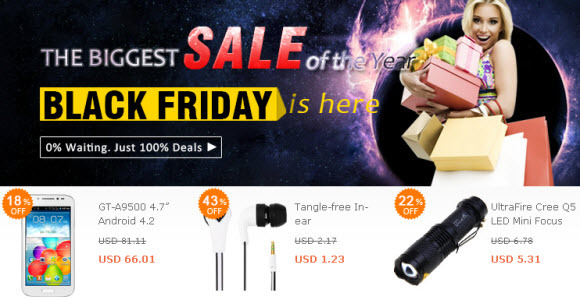 Just add this post to your favorites to check back the 2013 Black Friday deals offered by China shopping sites more conveniently.